Taboo came to Nicola as a cheeky, hardly rideable, crazy, four year old. The plan was to bring him on and sell him. He was well bred and had an enormous jump -coupled with an enormous fly-buck! Little did she realise that he had been very hard to break, was cold-backed, cut late, a bully with the other horses and was generally a bit of a brute. Taboo was well known in Gloucestershire for his numerous attempts at unseating Nicola and the capability of clearing a warm-up arena in seconds, but it was always just his playful character rather than any malice. He was also well known with fellow riders in the area for charging at them as they rode past - the local riding school even stopped hacking by - and jumping from field to field. Six foot high fences had to be installed to try and keep him in one place. He like creating his own fun! Nicola and Taboo had a brilliant seven years competing together. They were successful at BSJA and dressage and Taboo excelled at eventing. They completed two CCI** together, numerous Intermediates and were shortlisted for the European CCI** team in 2011. Sadly an injury at the age of eleven meant that they had to say a hard goodbye. In Nicola's words, 'Taboo was my best friend, my secret keeper, my superstar and my safe keeper rolled into one. A one in a million, we had a special relationship and he looked after me every step of the way. This was my 30th birthday present from my husband. 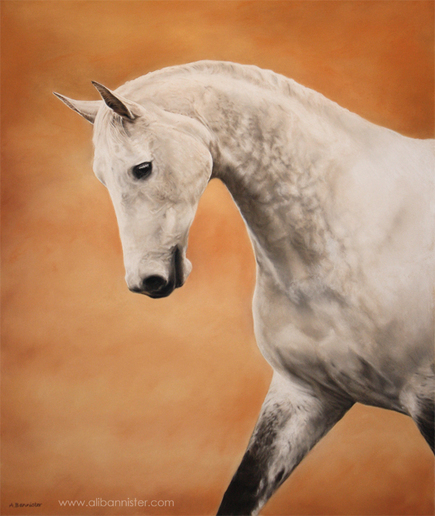 Ali had to create this pastel painting from a collection of photos and she has captured Taboo's quality and elegance beautifully. A beautiful, treasured piece for my beautiful missed everyday best friend. RIP Taboo x'.